Screenwriting is where it’s at, or should we say … where it begins. 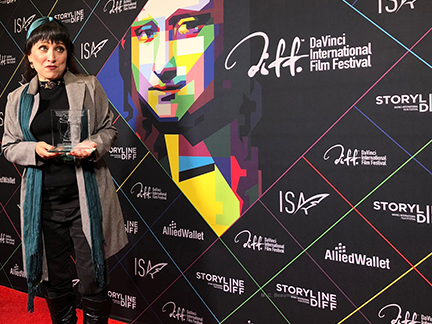 At DIFF, we believe that every great picture starts with a great screenplay, and so we set out to HONOR writers who are committed to the craft — those who work tirelessly to create new worlds, rich characters, compelling conflict, and stories that forever change us. STORYLINE awards quarterly winners with DIFF’s Vitruvian Award™. These writers will automatically be entered into the annual competition for their shot at The Leo — DIFF’s most prized commendation. In addition to The Leo, our winner will receive an award package from festival sponsors. Submitted scripts must be original, and the sole property of the applicant(s). Feature and Short scripts must be in Master Scene Format. Feature screenplays must be between 80-120 pages in length. Short screenplays must be under 40 pages in length. There is no limit to the number of entries you may submit. You may not submit the same script more than once. Under absolutely no circumstances will substitutions of either corrected pages or new drafts of the entry script(s) be accepted. If a submitted script becomes optioned, produced or purchased between the time of submission and the end of the judging period, that script will no longer be eligible. All entries must be uploaded in PDF format. Scripts will not be returned. Competition judges, readers and employees of STORYLINE or the DaVinci International Film Festival (DIFF) Screenplay Competition, past and present, and their immediate friends and families, are not eligible to enter. Scripts submitted under a pen name will be immediately disqualified. Script title cannot be changed after submission under any circumstances. † Vitruvian and Leo Winners. Have questions? Please visit our FAQ section, or send us an email, and someone will get back to you soon. Thank you. 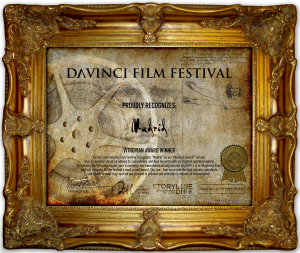 The Leo is DaVinci Film Festival’s most PRIZED award, and given to the best feature screenplay among our Vitruvian winners at our live showcase event. The Vitruvian Award is given out to our Quarterly Winners, who are [then] automatically entered into the running for our Leo Award for our live event. Much like our film division at DIFF, we receive so many great projects and unfortunately can not honor all. But we do allow for an Honorable Mention. In addition to our Leo and Vitruvian Awards, our winning screenwriters will receive the DIFF Winner’s Certificate and a prize package provided by our sponsors, including writing software, writer’s platform memberships, development deals, and more! Storyline proudly accepts entries through our film festival partner, FilmFreeway. Submit with confidence by clicking the logo below. Without the ongoing support from our sponsors and festival supporters, we would not be where we are today. Below are a few of those who help make DIFF/STORYLINE possible. If you have questions about STORYLINE, submission policy, or any other inquiry, please fill out the form below or email us, and someone will get back to you within 24 hours. Alternatively, you can give us a call for a quicker response. 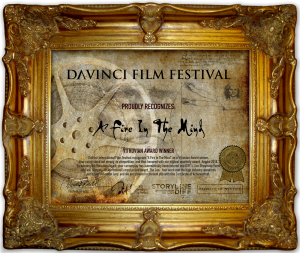 Thank you for your interest in STORYLINE by DaVinci International Film Festival. © 2019 DaVinci Film Festival LLC. All Rights Reserved. Video by Crosspoint.